Please do not buy these translations off Amazon! 25 Aug 2016: I was recently informed that someone has put up my translations for sale on Amazon. My translations were not meant for sale and will always be available to read for free in their entirety. These are not official licensed translations and should not be sold. Please do not buy this book! Kodansha's Children's Books Dept. has an English e-form for inquiries. It is 2017. After being chased from No. 6, sixteen-year-old Shion sees the outside world, and its reality, for the first time. What was it that I thought I knew? What have I been seeing all this time? Shion strives to live through every day he spends with Nezumi, but he is confronted with a fateful question― "Me, or No. 6 - which one do you choose?" Fate accelerates, and bears down upon the two. This is why humans are troublesome. The more you involve yourself with them, the tighter the shackles become. It becomes harder to live only for yourself. Nezumi receives a memo from Karan reporting that Safu has been taken away by the Security Bureau. Although he keeps it under wraps, Shion finds out the truth and resolves to save her. The chance of success is infinitely close to zero ― and the story breaks into full sprint! How would he enter the Correctional Facility? What was waiting for him inside? He would resort to anything to seek it out, and find a way to infiltrate it. It would be the only way he could save Safu. Nezumi, Inukashi, and Rikiga are moved by Shion's passion and determination. But the army has begun to attack people indiscriminately. The Hunt, it was called. But for what purpose―? Was this the end for him? Shion and Nezumi succeed in infiltrating the Correctional Facility in order to save Safu, who has been taken away by the Security Bureau. But what awaits them is worse than anything they could have imagined - like Hell on earth. Shion is close to giving up. On the other hand, an ominous force looms closer to Safu every minute. What will unfold in their future? 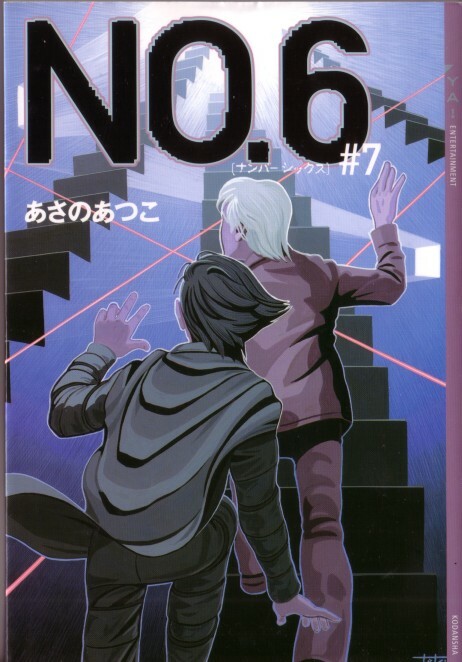 Shion has reached the underground depths of the Correctional Facility, and meets an Elder who knows of Nezumi's past. From him, he hears of the invasions and genocide that No. 6 has perpetrated in its history. What awaits the Holy City now - destruction, or salvation? The doors of the Correctional Facility, against all odds, have opened at last. Their destination - the topmost floor, where Safu is being kept captive! At the end of a fierce battle with the soldiers of No. 6, what meets Shion's and Nezumi's eyes? Shion is reunited with Safu at last. But the fates are ruthless, and their reunion is also their eternal parting. As the Correctional Facility heaves under explosions and roaring fire, Shion and Nezumi enter their last battle to escape! Shion barely manages to escape the Correctional Facility as it crumbles into ruins. Nezumi is close to dying, and they join with Inukashi and Rikiga to head into the city to save him. After he has learned of all that surrounds No. 6, Shion embarks to the Moondrop, with the future of the people in his hands! One rare, peaceful day in the West Block -- Shion, who chose to remain in No. 6 after its destruction -- Nezumi, who wanders like the wind. And finally, the secret of Shion's father. Vivid fragments are cut out from the lives of each, instilling spirit back into the story whose end was a sore parting for many.